If you wish to add sound to your animation, it is recommended to edit and mix your sound files in a sound editing software. Having full-length pre-mixed soundtracks ensures the audio preserves its timing, mixing and quality should you use third party software for post-production. Another good practice is to keep your soundtrack separated in tracks for music, sound effects and characters to make it easier to sync your animation with voices and sounds. Otherwise, it is possible to clip sound effects and adjust their volume directly in Harmony when needed. If you create your project in Toon Boom Storyboard Pro, you can export all of your project's scenes as separate Harmony scenes. The storyboard's sound track will be cut up by scene and each piece will be inserted into the exported scenes, allowing you to save time on splitting and importing your sound track. Harmony can import .wav, .aiff and .mp3 audio files. NOTEImporting a soundtrack longer than your scene will not extend your scene's length. Sound playback will stop at the end of your scene's length. From the top menu, select File > Import > Sound. In the Xsheet view, right-click anywhere in the frame area and select Import > Sounds. From the Xsheet menu, select File > Import > Sounds. From the Timeline menu, select Import > Sounds. 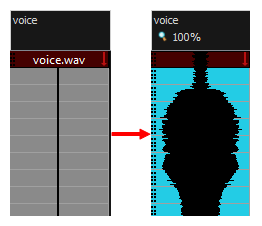 The sound file appears as a layer in the Timeline view. Its waveform is displayed in the track to help you visualize at which frames the sound effects in your soundtrack occur. Your soundtrack also appears as a column in the Xsheet view, but will not display a waveform by default. If you wish, you can display a sound column's waveform by right-clicking on it, then selecting Sound Display > Waveform.